Whether it is due to genetics or the inability to exercise as often as you’d like, resistant fat is a pesky issue for both men and women. No one wants to feel overweight or uncomfortable in their clothes. Unfortunately, as we age, slimming down becomes more difficult, leaving us self-conscious about our bodies and dissatisfied with our appearance. The good news is that we now have the technology to safely address unwanted fat in stubborn areas without downtime. * Patients of Dr. Quibell now have the ability to spot reduce in a way that is not possible with through diet and exercise alone. 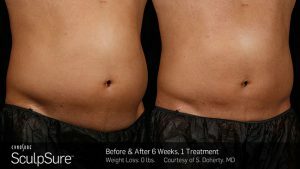 What to expect with SculpSure? At MDTLC, patients love the ease and simplicity of SculpSure treatments. Since no surgery is required and there truly is no downtime involved, patients can come in whenever their schedules permit. * After a short 25-minute treatment, they are free to go back to work or resume daily activities with no signs of having undergone any procedure. * Dr. Quibell offers everyone patient-controlled PRO-NOX, a 50/50 gas blend of nitrous oxide and oxygen, or apply a topical anesthetic to minimize discomfort and anxiety during the session. 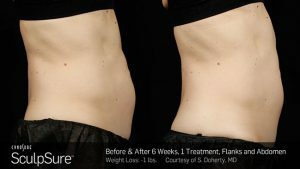 Interested in learning more about SculpSure?